It was love at first sight for Kayleigh and Leia — or perhaps it would be more appropriate to say love at first peck. Kayleigh visited Petco one afternoon in between her shifts at work. It just so happened to be an adoption day, and Kayleigh hoped to find a cat who could accompany her to her new apartment — even though that was a month off. She approached one cage that contained three cats and stuck a finger in the cage to try to pet them. “That’s when a petite torti started to lick my finger, well, tried to anyways. I was confused at first because she was almost pecking at my finger. I knew I wanted her,” Kayleigh said. She spoke to a woman from the shelter, who told her the kitten was a special needs cat with balance issues. That didn’t bother Kayleigh at all, and in a few weeks once Kayleigh had moved into her new home, the kitten, Leia, came too. Leia, who was about a year and a half old in March, has moderate CH. Kayleigh says being surrounded by another cat without her condition motivates her to work on her walking and climbing. When it comes to the litter box, Leia is perfectly capable. She can use one with a hood and has a second without one — but if she uses it, she may make a big mess if she loses her balance and falls, which can lead to litter being flung everywhere. When she eats, she uses her paw as a scoop to fling food onto the floor where she can peck at it. Drinking is no different than other cat, she’s just a little loud! To help her, Kayleigh bought elevated bowls. Kayleigh also owns a platform bed so Leia doesn’t fall far when she accidentally rolls off. Recently, Leia conquered her fear of falling down stairs by surprising Kayleigh in the basement one day! It went so smoothly, Kayleigh didn’t even hear her wobble her way down! Kayleigh and Leia have a special connection — it’s almost like Leia has a sixth sense when it comes to what her mom needs. If she’s sick or sad, Leia is right there by her side. Kayleigh’s advice to other CH parents? “Although your cat’s movements may be different from some other cats, it is only a reason to love them more. I’ve had “normal” cats my whole life, but they’ve never loved me like my CH baby does. They seem to be extra attached and loving. Also, they’re less likely to be naughty! Kayleigh‘s favorite thing about Leia’s CH is that it helps her to not get into or jump onto things and be naughty! It also seems like Leia is a more attached cat. Kayleigh’s least favorite thing is seeing her take a nasty spill or the people who constantly make fun of Leia. Some have gone so far as to make mean videos or songs about her. “My journey so far with Leia has been easy as far as caring for her. It’s my peers who have made anything in her life difficult. I am now known as the “crazy cat lady” because I love Leia like a child and will stand up for her when someone down-talks her. I even had to kick my roommates out due to their lack of understanding her and making fun of her. She’s beautiful! I hope Kayleigh and Leia have many happy years together. Is the tail curled up over the back (as in the second photo) a common CH thing? 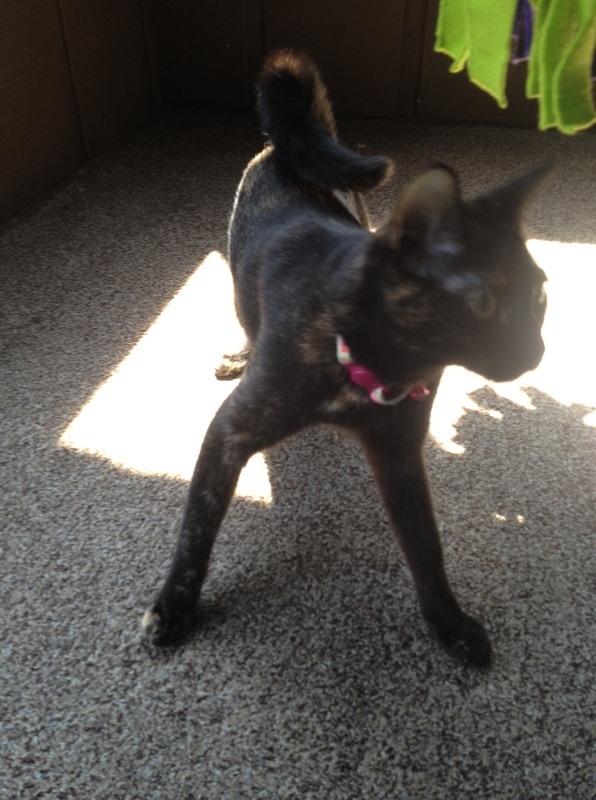 It looks almost identical to how our CH girl often holds her tail – I figured it’s a balance thing? What a beautiful tortie ladycat! I was Mom to a special needs tortie ladycat who went to the Bridge in January, and feel the same as Kayleigh when she described how much of a bond you develop with a special needs kitty and the devoted love they have to give. My ladycat did not have CH, but her condition was chronic and she had it almost her entire life. I would not hesitate to adopt another special needs cat again, and would love to have a CH kitty from following your blog and reading about how wonderful kitties with this disorder are. Leia is a lucky ladycat to have found a compassionate soul like Kayleigh for a Mom.